– Press the release catch on the boot lid ⇒ fig. 46. 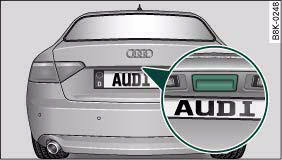 – The boot lid is unlocked and opens automatically. – Push the boot lid up slightly to secure it in the open position. 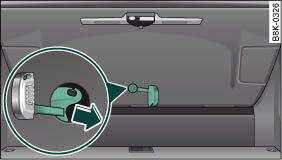 – Pull down the boot lid by the handle on the inside and let it drop into the latch ⇒ . The boot lid can be released manually from the inside. – Prise off the cover (using the emergency key) ⇒ fig. 47. 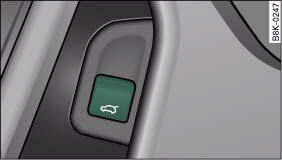 – Press the sliding lever in the direction of the arrow to unlock the boot lid.